This year parents, with the iPads in the classroom we are using a spelling app to learn, teach and test our students on their spelling words. The children will be using the spelling city app everyday to learn their words rather than the traditional notebook. In the past very few students have remembered to bring back or get their notebooks signed. The iPad will change this. Although the app requires an internet connection to use the activities the students will still be able to learn their words at home in a traditional way i.e. Read the word out loud, cover/hide the word, say the word again OR Read the word out loud, cover/hide the word, Write the word out. Repeating this is important for the word to stick, so DON'T allow your son/daughter to only do each word once, have them repeat each word multiple times. 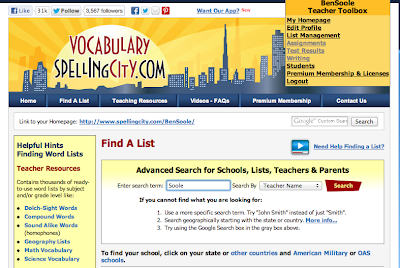 If you want to look at the lists or activities log onto https://www.spellingcity.com or click here for my homepage and class lists https://www.spellingcity.com/BenSoole/ . If you want more information just come in and see me. 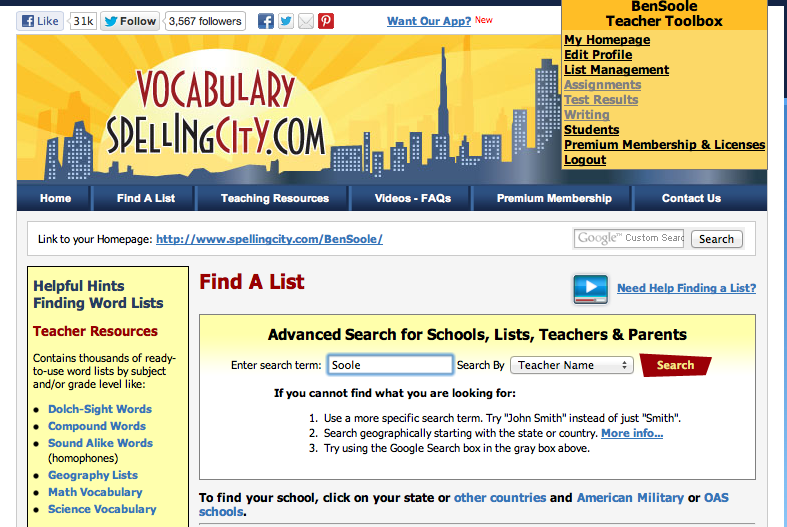 To find a list just click on the "Find a list" button then type in "Soole" and search by teacher. This will bring up our lists. Have fun learning their words with them and remember to explore the other spelling, language and word activity apps that are loaded on the iPad. They don't all need an internet connection.